Damn, have I been waiting for this! Unknowingly, that is. I haven't counted the days until the release, no, but from the very moment I pressed play on their new album Lost In Space, I knew what's been missing in my life - Gentleman's Dub Club! They are back with new music, and while I thought anything after The Big Smoke (2015) and Dubtopia (2017) would have a hard time outdoing its predecessors, Lost In Space adds a whole new dimension to the band's output. The way the first song fights its way to audability through the sonic orbit of the intro already is a highlight. And then, starting this trip with Light The Fuse is a lit idea for several reasons. One, it's a steaming steppas track that you can't help but move to - a perfect warm-up for what's to come. Two, it introduces the special flavour of this release: pumping bass, bright horns and spherical sound bits and pieces that catapult you right into another realm filled with interstellar wonder. Three, the voice of singer Jonathan Scratchley is at its best, on point in its unique, clear articulation, hitting every note with the right amount of intensity. "Now we got nothing to lose!" Stardust, the first single release, continues the foundation thus laid, and once you've seen the video, you won't be able to get rid of its vivid images. "I came here on the wings of a butterfly..."
Quiter notes are struck in Ground Shakin’, a song dominated by a melodic chorus and the dialogue between a warm organ and, once more, those fantastic horns of theirs. "Surrender to a new tone!" Up next, "let's get Out Of This World, into the night where there's black, there is gold" tries to lure a lover away from everyday life, making it a tender track that doesn't however quite reach the musical significance of the following. An ode to Mars, the instrumental God Of War gives plenty room to the skilled musicians of the band, uniting the solo parts of Kieren Gallagher (sax), Matt Roberts (trumpet & trombone), Luke Allwood (keys), Nick Tyson (guitar), Toby Davies (bass), Niall Lavelle (percussion), Tommy Evans (drums) and Harry Devenish (sound) to an exciting, organic whole. The second single Turning Back (released in December 2018) is a collaboration with Swedish singer Million Stylez, a piece equally energetic as the first track. What a moment when diving into a different galaxy of sound at 3:22! "Ain't no turning back, you better know where you're going." Eye Of The Storm, Intergalactic and Midnight Healing bring in the steppas flow once more that is so present in this release. "Feeling safe even in the chaos!" Finishing off this ear-blowing trip with a beautiful Reggae scorcher, Walking Away features foundation artist Winston Francis aka King Cool, sporting the best fadeout I've heard in ages. 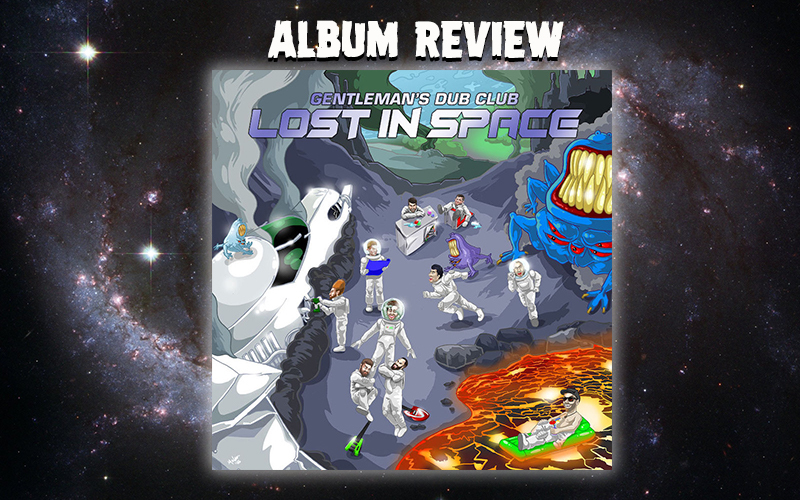 With Lost In Space, Gentleman's Dub Club deliver an opus that makes me wanna hop on a space shuttle right now, and we'll definitely encounter it among the contenders for the album of the year 2019!